Every worker needs a tax code and this is what your employer will use to work out how much tax you need to pay. This is the tax code currently used for most people born after 5 April 1938 with one job. Numbers: these refer to how much income you can have before you pay tax. If you have 1100 in your tax code this means that you can earn up to £11,000 without paying tax. Letters: Usually one letter; it refers to your situation and how it affects you tax-free Personal Allowance. ‘L’ shows that you are entitled to a basic tax-free Personal Allowance. Your payslips, P45, end of year P60 or Pay Coding Notice letter will show your tax code. If you don’t have a tax code, HMRC will send you one once your employer has filled out a new starter form. K in a code could mean that tax is being paid through wages that are owed from a previous year. Or you are getting the State Pension or benefits from work such as a company car. M means you’re receiving a transfer of 10% from your partner’s Personal Allowance. N means 10% of a your Personal Allowance has been transferred to your partner. W1 (week 1) or M1 (month 1) are emergency tax codes. This means that tax is based only on what is paid in the current pay period – either week or month – and not the whole year. These codes are known as ‘non-cumulative’. Emergency tax codes are usually updated automatically after you get your P45. An employee will always start a new tax year with a normal tax code, not an emergency one. There are more tax code letters…You can read about them here. If your circumstances change either you or your employer will need to tell HMRC and it will issue a new tax code. Taxable State benefits such as State Pension. A tax code will also change if you need to pay tax from a previous year. 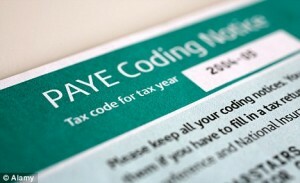 HMRC will send out a Pay Coding Notice if the code changes. This will tell you what the code is and how it’s worked out. If you notice your tax code is wrong you’ll need to speak to HMRC. You can call 0300 200 3300 or fill out the form online.